Adjustable size: 34.5 cm long. Hypoallergenicity: Take such non-toxic, healthy materials and add non-allergenic ingredients, don't worry about pet allergies. Durable Protection: Normally, this product lasts up to eight months (even in water). Shelf pulls. (Unless otherwise stated above). For Cats and Kittens. Break-Away Collar. 7 month Protection for killing fleas and ticks on your pet. Color White. 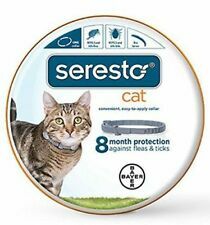 Bayer Seresto Flea and Tick Collar for Cat, all weights, 8 Month Protection. Kills and repels fleas and ticks for 8 continuous months in one easy-to-use, non-greasy, odorless collar. Quickly kills fleas within 24 hours of initial application. Functon: Anti insect dog collar. Feature 1: Cat dog flea collar. Feature 2: Cat pet collar anti flea and tick pest. Collar Type: Basic Collars. Feature 3: Dog Accessories. Service life: 8 moths. Main ingredient. TropiClean Natural Flea & Tick Cat Collar is safe when used as directed to protect and defend against those irritating fleas, ticks and mosquitoes. Repels up to 4 months. This flea and tick collar can give your cat the ultimate shield protection against fleas and ticks for 6 months. And it is easy to use, j ust place around cat ’ s neck then cut to fit. ALLERGY FREE: Made of all-natural ingredients, safe for cats and humans, does not cause irritation or allergies. Cheristin is available without a prescription. Note: Cheristin is for use in cats and kittens 8 weeks of age or older and weighing 1.8 lbs or more. Always read, understand, and follow the label and use directions. 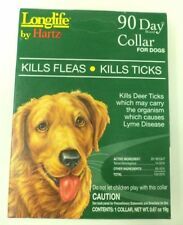 Hartz Ultraguard Plus Flea &Tick Cat Collar. Condition is New. Shipped with USPS First Class Package.have 6 boxes available ,price is per item. When taking a bath for your pet, you can remove the collar. The largest neck circumference is 24 cm, suitable for all pet whose neck is smaller than 24 cm. When your pet plays outside, the collar can protect it efficiently from fleas, lice, mosquitoes, acarids, etc. The collar must be worn loosely to allow for growth of the pet and to permit the collar to move about the neck;. For Cat 29cm 1.0cm 0.2cm (Adjustable). Place collar around pet's neck,adjust for fit;. Kills flea and ticks. For dogs with up to 20.5" neck size. For cats 10 weeks or older. Item model number: 80000. Learn More. Water resistant protection. UPC 724089579522. LUCESO flea protection collar for cat. ♥ 1 strap for the cat provides protection for 8 months in a row ; Waterproof feature and easy to clean. 8 Month Protection, 1 size fits All, all weights - anti tick, larvae, mosquito, lice. The Bayer Seresto Flea & Tick Collar for Cats 10 weeks of age and older provides continuous 8-month flea and tick protection. Seresto cat collars are made with a long-lasting, 8-month formula for continuous-release coverage over your cat's skin and coat. Original Item - Beware of Low Price Fakes on eBay! Bayer Seresto For Cats (8 month protection). Condition is New. Shipped with USPS First Class Package. This is brand new never opened!!! Fast shipping ! !